(Due to limitations of space, only the invited papers are listed below). Invited Papers: I. Catalysis and Catalysis-Related Properties. Skeletal rearrangement reactions of olefins, paraffins and aromatics over aluminophosphate based molecular sieve catalysts (J.A. Rabo, R.J. Pellet, P.K. Coughlin, E.S. Shamshoum). Zeolite and matrix structures and their role in catalytic cracking (C.J. Groenenboom). Shape-selective catalysis in zeolites with organic substrates containing oxygen (R.F. Parton, J.M. Jacobs, D.R. Huybrechts, P.A. Jacobs). The use of zeolite catalysts for the synthesis of nitrogen-containing organic intermediates (W.F. Hoelderich). II. Sorption. Fundamental research and modeling for a technical process of selective adsorption of normal paraffins (Parex''-process of DDR) by zeolite A (W. Schirmer, K. Fiedler, H. Stach, M. Suckow). Sorbex technology for industrial scale separation (J.A. Johnson, A.R. Oroskar). III. Ion Exchange and Detergent Building. Industrial production of zeolites (E. Roland). Calcium and magnesium exchange in Na-A, Na-X and their precursor gels (L.V.C. Rees). Fundamentals of phosphate substitution in detergents by zeolites - cobuilders and optical brighteners (M.J. Schwuger, M. Liphard). IV. Modification and Characterization. Author Index. Subject Index. This new book will be welcomed by companies involved in catalysis and catalyst manufacturing, sorbent and detergent production, chemical and petroleum refining, and by research scientists in academia. It contains 76 original contributions of recent work on fundamental and technological aspects of zeolite research and application. Particular attention is paid to novel developments in zeolite catalysis, sorption on zeolites and use of zeolites as detergent builders. Problems of zeolite synthesis, structure, modification, ion exchange, diffusion and novel applications are also dealt with. Topics which are the subject of much current interest are also treated, e.g. 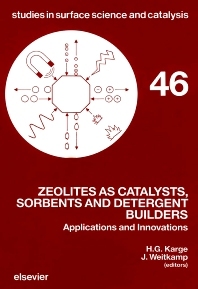 new catalytic applications of zeolites in the synthesis of fine chemicals, novel formulations of detergent builders and industrially developed zeolite-based separation processes. The application of zeolites is also discussed from both economic and ecological points of view. The contributions cover a wide range of materials and results which are organised, to a large extent, in tables and figures and are identified by appropriate keywords. The meeting at which these contributions were presented was the latest in a series of smaller, more specialized zeolite meetings which are held in between the large International Zeolite Conferences. Participating in the symposium were experts from both industry and academia who gave invited lectures, oral and poster presentations. The resulting book provides a large body of helpful information for present and future work and development in zeolite research and applications.